It was Open Farm Sunday at the weekend and we were among the Sussex food and drink producers that took part at Cockhaise Farm’s Open Farm event. The farm is less than a mile from the Dairy, as the crow flies, and is where we source our organic cow milk from to make cheeses like Tremains Organic. The Open Farm Sunday initiative was launched in 2006 by the charity LEAF, Linking Environment and Farming, and is designed to show people first-hand what it means to be a farmer. Hundreds of farms up and down the country open their gates and welcome the public in for this year’s event on Sunday, 10th June. Cockhaise Farm has taken part for a number of years and this year’s event offered visitors the chance to tour the farm and see some of their 240-strong herd, sheep being sheared and to join tractor rides around the farm. Other Sussex food and drink producers at the event included Sussex Chefs and Caroline’s Dairy. There were around 900 visitors to Cockhaise Farm on the day – including a camera crew from Meridian TV who interviewed Mark! You might have spotted him on the evening news talking about the importance of giving people an understanding of where their food comes from. In addition to giving people a chance to taste the cheese that we make from Cockhaise milk, we also ran a competition asking people to guess how many litres of milk go in to making a 3.640kg wheel of Tremains Organic cheese. The answer? 34.58 litres! 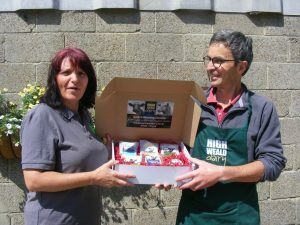 Our lucky winner was Ree Woodward (pictured above with Mark) who won a hamper of cheese. Entrants to our competition were asked to make a donation to the event’s charity partner, The Bevern Trust. The Trust is a Sussex-based disability charity which supports young adults with profound learning disabilities. Take a look at the Farmers’ Markets and Shows pages to see other events we’ll be selling cheese at this summer.